An elegant women's 14k gold floral wedding ring to add a touch of elegance to your engagement ring or for everyday wear. This vintage inspired delicate gold flower pattern wedding band reminds me of a time when understated elegance was all you wanted in a ring. 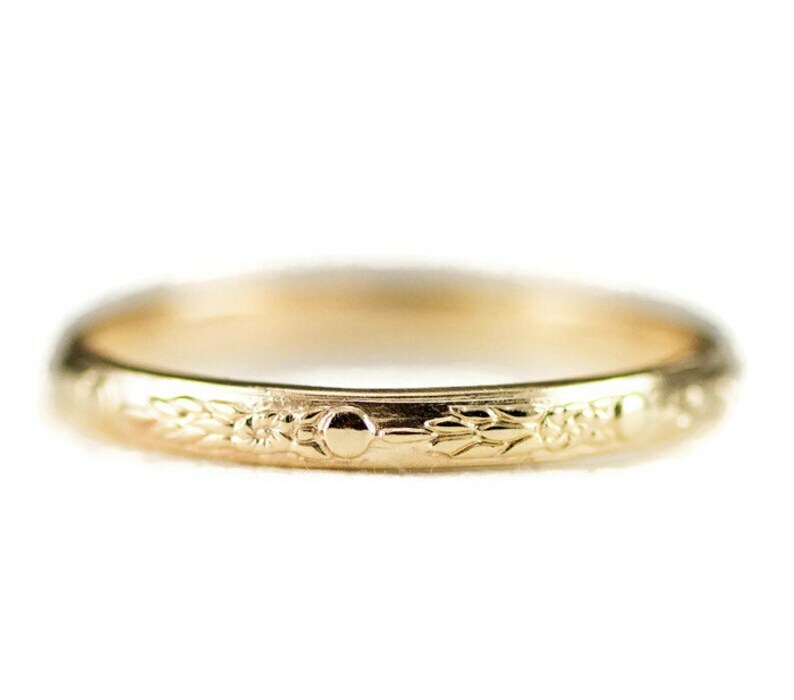 This is a narrow minimalist half dome band with a continuous repeated crisp flower pattern that has the look of a hand engraved ring, the ring is slender but thick enough to wear daily. The band can be custom made in ring sizes 3-12 with all increments in between. Variations: This band is available as a custom order in 14k white gold. Contact me for a quote. Please note: This is a continuous pattern stock wire not a cast ring. I make the ring to fit the size you request so there will be a break in the pattern at one point where I solder it. I try to make this as inconspicuous as possible but cannot guarantee the perfect pattern you see in cast rings that are mass produced. This ring is handmade to size so it has to be cut and soldered. All my rings are custom made to your specifications. Please read my shop policies on custom orders and ring re-sizing and ask any questions before purchase. Since this ring is custom made to order just for you, please allow me time to make and ship your ring. Items are usually shipped within 7 business days. Your ring will ship in a box suitable for gift giving. I include a storage pouch and a square of Sunshine polishing cloth with every purchase.